Deluxe Class Wood And Brass Ship Wheel Clock 24"
Deluxe Class Wood and Brass Decorative Ship Wheel 30"
Rustic Light Blue Decorative Ship Wheel With Sailboat 6"
Deluxe Class Wood and Brass Decorative Ship Wheel 12"
Deluxe Class Wood and Brass Decorative Ship Wheel 15"
Deluxe Class Wood and Brass Decorative Ship Wheel 60"
Deluxe Class Wood and Brass Decorative Ship Wheel 24"
Antique Copper Decorative Ship Wheel Christmas Ornament 6"
Chrome Ship Wheel Christmas Ornament 6"
Classic Wooden Whitewashed Decorative Ship Steering Wheel 18"
Classic Wooden Whitewashed Decorative Ship Steering Wheel 24"
Classic Wooden Whitewashed Decorative Ship Steering Wheel 36"
Classic Wooden Whitewashed Decorative Ship Steering Wheel 48"
The Hampton Nautical Deluxe Class Wooden Ship's Wheel is by far the highest quality ship wheel available. Our Deluxe Class solid wood ship wheels have distinct and clearly visable wood grain. In addition, they are hand-sanded with additional coats of lacquer which give this decorative ship wheel a slight gloss which makes this a perfect nautical decor accent for your home, boat or office. Made from rare, high quality Shisham wood which is hard, strong and is highly regarded for its ability to resist the elements. The decorative wooden ship wheel has six spokes, each skillfully turned and assembled with plugged screw heads. The brass center hubs have uniform sizes holes and machined keyways. In addition, the center of the wheel is solid brass and includes a real, working clock. 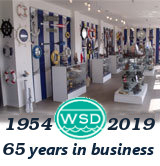 The clock is approximately 4-inches in diameter and rests perfectly inside the ship wheel. This small wooden ship wheel clock requires AA batteries to operate (not included) which can be easily installed in the back. This ship wheel clock also features a hinge on the back, making it very easy to hang on any wall. NOTE: This wooden ship wheel is for decor purposes only and is not indented for use on a seafaring vessel. Dimensions: 24" x 2" x 24"
Embrace your love of the sea, from the warm sunshine to the cool mist of the ocean spray, and bring it all into your home with our fabulous ship wheel décor. Each wooden ship wheel is crafted from beautiful and historic woods, presenting a piece that not only represents sailing’s past but is a contemporary work of art. 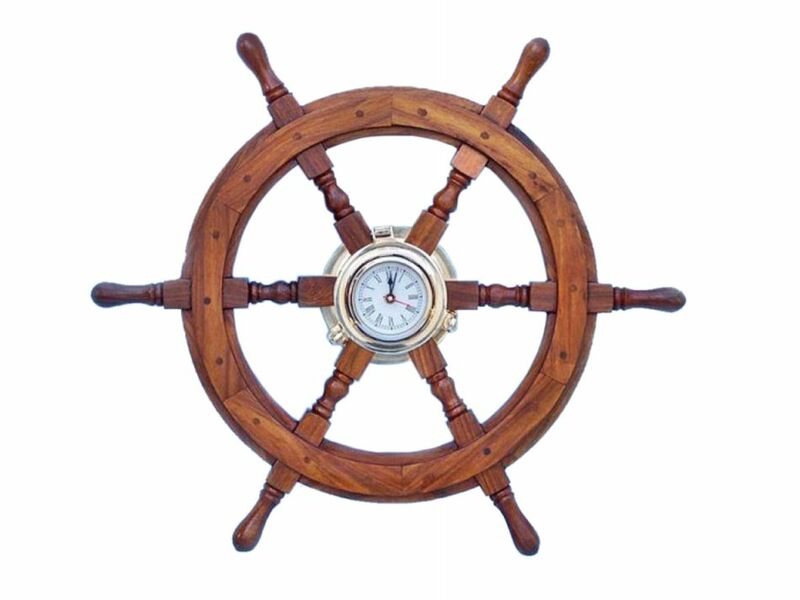 With its authentic craftsmanship this antique ship steering wheel will proudly adorn any wall, a perfect conversation piece that brings to life the nautical world. Our ship wheel décor is reminiscent of days spent sailing out around Cape Cod, heading into the sunset on the rich Pacific, or relaxing in the plush luxury of your yacht as you cruise through the Bahamas. For the ship’s captain, sailor, or nautical enthusiast, our ship wheel décor seamlessly blends life at sea with life at home.